10 July: a ‘season of struggle’? 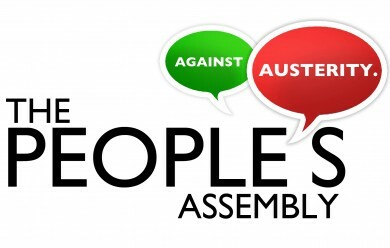 An initial response to the announcement from the People’s Assembly that there will be a ‘mass strike’ on 10 July this year. When it was launched last year, the unique selling point of the People’s Assembly Against Austerity was that it wasn’t just another Trot recruitment front. No, we were earnestly informed by Owen Jones et al, this was the real deal: a united front behind which we could all rally and build a movement. At the time, I was cynical. That cynicism hasn’t wavered in the intervening time. Instead of just one talking shop in London with a heavily stacked top table, there were heavily stacked talking shops around the country. The People’s Assembly banner was draped over existing local anti-cuts activity. Some people stood outside the Daily Mail to defend Ralph Miliband’s patriotism or something. More people stood outside Payday Loan Shops. Various national demonstrations in London were announced. So far, so predictable. The fact that it’s celebrity leftists like Owen Jones and Mark Steel front and centre give it more pull to the casual protester, but the People’s Assembly is still playing to a well worn formula. Not to mention that you still have the innards of its former incarnation as the Coalition of Resistance below the relatively-well-known-columnist surface. You may be surprised. As will the vast majority of members and activists in the unions apparently taking this action, who are still awaiting the results of ballots and the debates at conferences that should be the deciding factors in what happens next. But if the date itself is out of the blue, the tactic of various tiny left sects dictating struggle to rank-and-file workers with scant regard for anything but self promotion is wearily familiar. This all gets a bit TL;DR as Rees drags out faithful old clichés to tell us how the 21 June demo is now the “springboard” for what follows. He excitedly jabbers on about what different blocs will be on the march, as if different coloured placards being organised in different sections of a parade matters all that much. Plus there will likely be street stalls on weekends, because people who live in cities will be unfamiliar with the sight of leftists thrusting leaflets at them as they shop. This is apparently exactly what Marx meant when talking about social unionism, honest. Rees ends by reaffirming that “repeated mass mobilisation can give us a chance to rebuild the strength of the whole movements,“ and is “critical if the tide is to be turned not just against the government but also against the emerging right wing populism of UKIP.” But of course, only the People’s Assembly “is perfectly placed to organise and co-ordinate this kind of resistance,“ so we should all trust in this latest self-declared leadership to lead us to salvation. The problem is that this is all nonsense, and Rees’s analysis is woefully devoid of – well, analysis. If the plan being outlined comes to fruition, what we have is not “sustained” action but a span of several months during which we’ll see four single-day set-piece events. There’s nothing to join them up except for the anticipation of the next one. There is no reason why this sequence of actions should be any different than the other sequences of actions we’ve seen in past years. Lots of buzz among the left, grand days out of activists and then the deflation for workers once they realise that having been marched up to the top of the hill all they have left is to march back down again. It’s a formula which boosts the profile of certain individuals and sells a few extra papers, but ultimately doesn’t make a dent in austerity. The debate about how we do make that dent is an important one, and one which needs to be had. As things stand, it is clear that the organised working class is – with a few exceptions – losing, and losing overwhelmingly. There are reasons for this, and they can be dealt with, but this is not something we can trust the stale left to even consider much less do. Firstly, we need to own up to the lack of an organised, national rank-and-file movement in this country. Rank-and-file activity may flare up at different times in various struggles, but once that struggle is won or lost it naturally dies down again. We can’t stop that ebb and flow, but questions need to be asked about how we maintain the broader grassroots culture even when a particular struggle declines and how we link up the rank-and-file from different unions and workplaces nationally. Then there is the question of strategy. There’s no one set blueprint for how we win, no matter what the left tells you, and a whole number of factors will determine what is going to be effective. The debate on where we go next needs to be had – but, importantly, it needs to be had in workplace meetings, on the floor of union conferences and in rank-and-file meetings, not behind closed doors among a select group of leftist talking heads. Finally, we do need to build up forms of social unionism. Getting the wider community involved in campaigns and action is vital, especially against something as broad as austerity which attacks those out of work more viciously than those in work and whose social consequences are at least as devastating as its industrial ones. But this cannot be covered with something as simplistic as ‘do street stalls.’ Nor does Unite’s community membership necessarily provide the answer, since in practice it is essentially a servicing union for the unemployed coupled with another protest outlet for activist types. Community organising is a long, hard slog that eats up an awful lot of time and resources. It involves a great degree of canvassing, leafleting, one to one conversations and other activities that the left as a whole is generally only prepared to utilise when it wants votes in an election. Effective examples we can look to are the Independent Working Class Association1 here in the UK or the CNT’s organising efforts in the Puerto Real shipyard strike. All of the above is patient, hard working, slow building stuff. There is no shortcut to a genuinely effective and militant mass movement, as much as some would like there to be. This doesn’t mean that nothing can happen in the meantime; those of us involved in trying to build rank-and-file activity will also agitate for strike action, put motions to union conferences and other such things to campaign in the here and now. Often, such short term campaigning activity can be a focus for the longer term building work. But that, too, needs to come from those directly involved in struggle. Otherwise, even if in the moment it provides a practical focus for workplace organising – as 10 July no doubt will – all of that work will rapidly unravel once the set piece is done and the left again demobilises the working class with a lack of strategy and a long period of inertia and inactivity. Now may be the time for action. But the point of our action is not to fit into a formula and a slogan of someone else’s design. John Rees would do well to remember that. 1. Notwithstanding criticism of the electoral aspect of its activity. Let's all vote for TUSC in May and have a 1 day strike every two years. Socialism innit? Thoughts and reflections of a class-struggle anarchist and antifascist from Liverpool, England.